I am so excited to have the opportunity to help announce Warby Parker's new Concentric Collection today! I recently purchased a pair of eyeglasses from Warby Parker, and was thoroughly pleased with not only with the service that they provided, but also with how stylish the frames are. I constantly get compliments about my "hipster glasses." Warby Parker's new Concentric Collection introduces three new styles; Benchley, Murphy and Everly; as well as a really gorgeous new color, Whistler Grey. The collection is named for a detail found on the interior ring around the the frames. The rings come in three colors inspired by the warm colors of the holiday season. The designs are all about compliment and contrast, and are meant to give a luxurious look with a subtle dash of color. The Concentric Collection includes both eyeglasses and sunglasses, and can be worn on men and women. Sometimes unisex frames don't really work for both men and women, but these really do! Just look at those good looking people up there. What I love about my Warby Parker frames is that they are the perfect accessory for so many different types of outfits. I can dress them up or down, and they work for so many different occasions. I thought it would be fun to take three of my favorite frames from the Concentric Collection and build some outfits for the holidays. My favorite eyeglass frames in the entire collection are the Benchley frames in Oak Barrel with a Flint ring. I would buy these in a heartbeat and wear them on a regular basis as part of my everyday look. They are similar to what I have now (Welty in Whiskey Tortoise), except I think the flint colored ring around the inside of the frame make them a little more exciting. Since the Benchley frames are perfect for every day wear, I thought it would be fun to out together an outfit to wear for Christmas morning. This is a very relaxed outfit, but honestly, I would wear this just about any weekend. Another pair of frames that I was actually a little bit surprised that I liked so much were the Everly frames in the beautiful new color Whistler Grey. They are a light colored acetate frame with a beautiful blue ring around the inside of the frame. They are very sophisticated and I can totally see myself wearing these to work, especially when we have special events that require cocktail attire. 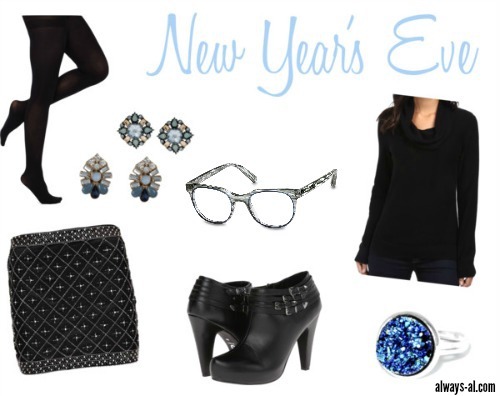 I thought it would be fun to create a New Year's Eve outfit inspired by the Everly frames. Black has been my go to for fancy outfits lately, and I always think you should sparkle on New Years. I love the different sunglasses that were introduced in the Concentric Collection. My favorite pair are the Murphy frames in Cognac with a Vulcanite ring. I love that these frames have the keyhole nose. That is one of the things that I love so much about my Welty frames. I also love the rich color combination of the cognac and the vulcanite ring. We always find ourselves travelling around during the holidays. Whether flying or driving, I always like to have a comfortable but cute outfit to wear. A great pair of sunglasses is the finishing touch of any travel outfit, I think. If you wear glasses, go check out Warby Parker's new Concentric Collection that launches today! They are an amazing company, and they truly have something for everyone. **I was not compensated for writing this post. I love the Warby Parker brand, and want to help spread the word about stylish eyeglasses!